I am a traveler, a singer, a poet, and a scientist. I drink scotch, smoke a tobacco pipe, and fold origami. I love to hike, bike, and swim in really cold water. I grew up in Bellingham, Washington which is somewhere between the Cascade mountains, the Puget Sound, Seattle, and Vancouver, BC. Its a lovely little college town on the water. 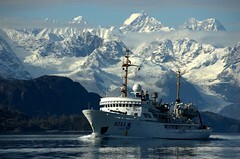 Since June 2008 I have lived and worked full-time aboard the NOAA Ship Fairweather. I work as a Senior Survey Technician on the ship. The ship is a 231 foot U.S. Government research vessel conducting surveys of the sea floor for the purposes of mapping and charting. 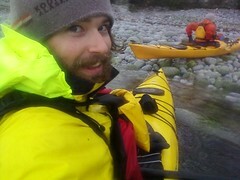 The ship works primarily in Alaskan waters. Beginning in 2010 the ship is joining an ongoing effort to understand the arctic as it changes. With the approach in the near future of a full melt of the polar ice cap during summer months the arctic is expected to become a major shipping route. We’re part of the effort to get it charted before the shipping starts. And you can follow me on DOPPLER, Facebook, Twitter and Plurk.